tradition, national holidays came to mind. Most prominent was Thanksgiving; probably because it's my favorite holiday, full of good food, family, football and giving thanks. That train of thought transported me to a personal tradition of thanksgiving that started 15 years ago, thanks to my 92 year old neighbor Doug. I was new to the area and my neighbor was a new widower. It was natural that we'd become friends; he needed purpose and I needed guidance. He took me under his wing and made it his personal project to show me around. He taught me the roads and best shortcuts, the best restaurants, where to get the best bargains and who to consult locally if I needed legal or business advice. We spent lots of time together and he always insisted on driving. Since we lived on a barrier island, excursions inevitably required crossing a bridge or two to the mainland. On the return home, at the top of the bridge, Doug would look all around, glance at me and say, "We live in a beautiful place." He never failed to repeat this mantra as we crossed the bridge headed home. When I asked him about it, he told me that he and his wife started saying it together 50+ years ago when they first moved to the island; culminating a lifetime dream to live at the beach. I asked him if he'd mind if we made it our tradition too. He was pleased to. Doug doesn't live on the island anymore, but I still do. And every time I cross the bridge heading back home I say "We live in a beautiful place." My entire family has adopted the ritual too. So, in tribute to my dear neighbor and the joyous tradition he instilled in my life, I created "Pineda", named for the bridge we most frequently crossed. I created this four-patch using traditional piecing techniques. Wow, I'd forgotten how time consuming and precise traditional piecing is when matching your seams! 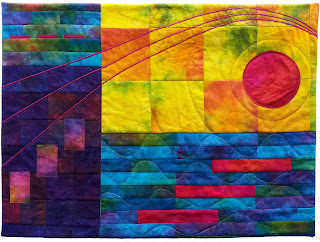 The sun and vertical rectangles are machine appliqué and the bridge is couched yarn. The bright hand dyes represent the vivid colors of this beautiful place. Stunning piece, L-M! The colors are so vibrant and so indicative of the ride across the bridge. Beatiful work about a touching tradition, and beautifully done. Thank you Andrea! You definitely know the beauty of this place...I love reliving the tradition that Doug passed to me. Beautiful, beautiful saturated colors, Lisa-Marie! And a great interpretation of tradition. You truly do live in a beautiful place, and it is wonderful that you continue to realize that. 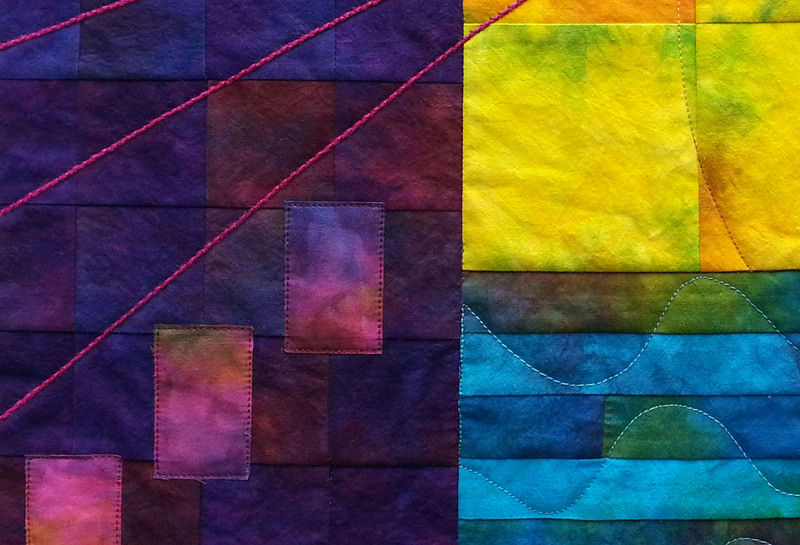 Your fabrics are great - did you dye them?